Home Services Garage Door Openers How to Spot and Properly Adjust Faulty Sensors? How to Spot and Properly Adjust Faulty Sensors? Homeowners don't usually give the steady green light on their photo-eye sensors a single thought until it turns orange. Faulty beams can create a lot of trouble and in most cases render the whole system unusable. Luckily, the solutions are generally basic and can be done through simple inspection and maintenance procedures. 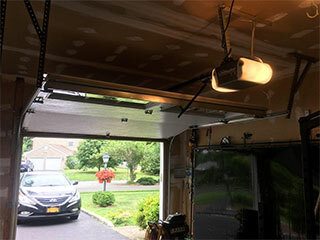 Here are the prevailing causes of issues related to garage door sensory beams and a little guidance on how to spot and resolve them. Ideally, both of your garage door beams should be directly facing one another. Have a look at both sides of your door to spot them and see if they are perfectly parallel. Maybe you have bumped one by accident when you were getting out of your garage or it's been thrown out of balance by another cause. Fortunately, you can sort out the issue in a minute by adjusting the mount of the device. Loose the wingnut holding the beam in its place and tightly secure it back into its proper position. Once the transmission is valid the display will show a green light. A pile of leaves, items from the garage or even a slightly thick spiderweb can block the connection and the path between your sensors. Also, something as trivial as dust and dirt amassed on the surface of your beams' lens is all it takes to interrupt the communication between them. Make sure you wipe clean the entire surface of the sensors, rid them off of any spiderweb and debris around so that the sensory line across the door remains unimpeded. Although less frequent, complex garage door sensor issues do happen. Maybe the communication between the opener and beams is defective or the wiring of the device itself is corrupted for multiple reasons. In these cases, the best practice is to hand the job over to a professional who knows how to avoid potential electrical injuries. It can be quite difficult to approach such problems by yourself let alone resolve them and hiring a skilled technician is the recommended way forward. If you need a professional to have a look at your sensory beams and offer a solution, Garage Door Repair Aurora is at your service. Our team can help you with anything related to garage door systems. That means repairs, maintenance and installation. Whether you need to have a broken spring replaced or a new opener set up, our expert technicians will be happy to offer you a helping hand. Find out more about us by taking a look at the rest of our website. Our technician will contact you before arriving. Until then, feel free to browse our website! Garage Door Repair Aurora is at your service!